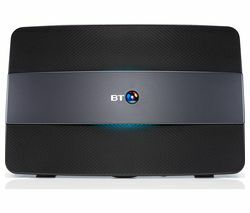 Get a strong and stable broadband and WiFi connection around your home with a BT router. It plugs into your phone socket to hook up to your broadband network, then allows you to share the connection with a range of devices throughout your home or office. A router is an essential piece of kit to getting online at home. A BT wireless router makes it easy to connect to the broadband network. Smart Setup means you can plug in and connect in seconds, without the need for a PC or laptop. With one USB and four Ethernet ports, the BT Hub 4r Unlocked Wireless ADSL Modem Router is perfect for connecting up to four devices securely, as well as allowing you to connect your devices wirelessly via WiFi. A BT router using dual-band technology operates on two bands at speeds of up to 300Mbps. It can switch between bands, automatically connecting to the strongest signal for a more consistent signal across your home network. Sharing files from a shared drive connected to the BT router is quick and easy via the USB 2.0 port, and remembering passwords is a thing of the past thanks to one button pairing that allows you to connect new devices instantly. For more ways to connect multiple devices, share your files, and get online at home or at the office, a BT wireless router is ideal. For a wider selection, check out our full range of modem routers, including our Netgear router collection.